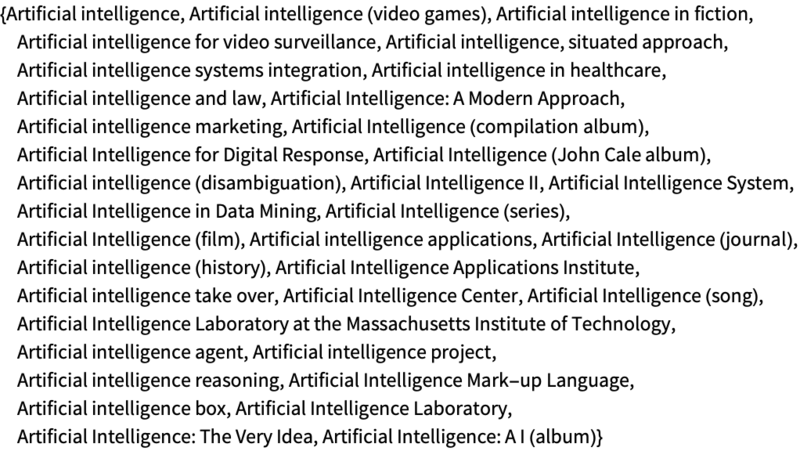 returns a list of Wikipedia articles whose titles include the given keywords. returns a list of Wikipedia categories whose titles include the given keywords. returns a list of Wikipedia articles whose content includes the given keywords. returns a list of Wikipedia articles whose associated coordinates are near the given location. WikipediaSearch utilizes MediaWiki's API to find article and category pages in the English-language Wikipedia. In WikipediaSearch[loc], loc must be a GeoDisk with a radius between 10 and 10000 meters.